00:30:00 Makes 16 servings, 2 Tbsp. each. This creamy appetizer has it all-it's easy to make, looks beautiful and is full of tangy flavour. Preheat oven to 400°F. Unroll crescent dough to form 4 rectangles. Place 2 of the rectangles, side by side, on nonstick baking sheet. Firmly press seams and perforations together to seal. Reserve remaining dough for decorative garnish. Cut block of cream cheese horizontally in half. 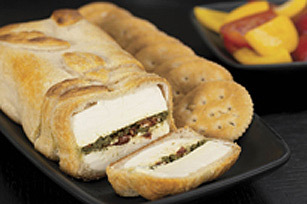 Spread pesto onto bottom half of cream cheese; cover with tomatoes. Top with remaining cream cheese to form sandwich. Place in centre of dough. Bring up ends of dough around all sides of cream cheese to enclose completely; pinch ends of dough together to seal. Place, seam side down, on baking sheet. Bake 20 min. Serve with Ritz Crackers and fresh vegetables. Cut leftover crescent dough into fall shapes, such as leaves or apples and place on top of appetizer. Bake and cool as directed. To save time, prepare this recipe several hours ahead and refrigerate until ready to bake.